I was at the hairdresser recently and overheard a conversation between a client and her stylist. The client, a teacher, was having a not-so-quiet rant about her students and their phones. The stylist, also a parent, was agreeing that kids should be required to turn off their phones in the classroom. I had to check my smartphone to make sure I hadn't embarked on some sort of weird time travel. I shook my head a little thinking maybe the fumes were getting to me. But no, the conversation was on-going. Finally I could no longer keep quiet, which comes as no surprise to anyone who knows me. I asked, gently and respectfully, what grade the teacher taught. 6th grade. I nodded and then asked, still gently and respectfully, if she was able to use any technology in her classroom. This 30-something teacher lit up, though not entirely in a good way as this question started another mini-rant. Yes, she has a classroom cart of Google Chromebooks. Yes, the administration provided some training for her and they're easy enough to use but she just didn't understand the big deal over using technology in the classroom. She thought they did just fine with their textbooks though occasionally she took them to the computer lab to do "some stuff." I must have managed to keep a straight face because she looked at me as though she thought I might or did agree. I took a deep breath. I asked her if she knew what kind of technology her students might be using in the middle school. She looked puzzled and a little perplexed. "Why would I need to know that?" I nodded. Sagely, I hope. Taking another calming breath. "Well," says I, "it might be helpful to know the technology expectations for 7th grade so your students are ready. I mean, if they're not prepared that could reflect badly on you or your school." She raised an eyebrow; her stylist paused. They just stared for several seconds. Then the client turned back to the mirror, looked at her stylist's reflection, and said, "Anyway. . . ". I wish I could say we were at a crossroads or on the cusp of something wonderful as teachers embrace technology in the classroom, as parents support and encourage technology in the classroom, but I know that is not true. Clearly. I wish I could say someone might be able to change this teacher's mind, and maybe someone can. I don't know what's at the root of her clinging tenaciously to her textbooks. There's a video circulating on Facebook: If the World Were 100 People. Some of that data is here; more detailed statistics and sources are here. It suggests that 75% of the world's population has access to a cell phone. According to Internet Live Statistics, roughly 46% of the world's population has access to the internet. To me, the fact that people don't have college degrees is less relevant than these literacy and primary/secondary education numbers. Because if people can read, even a little bit, they can learn. What this suggests to me is that the potential for virtual learning becomes globally explosive. Which means that teachers who find comfort in textbooks--and I'm not saying textbooks are terrible and have no place--need to rethink their perspectives about teaching and learning. Fast. 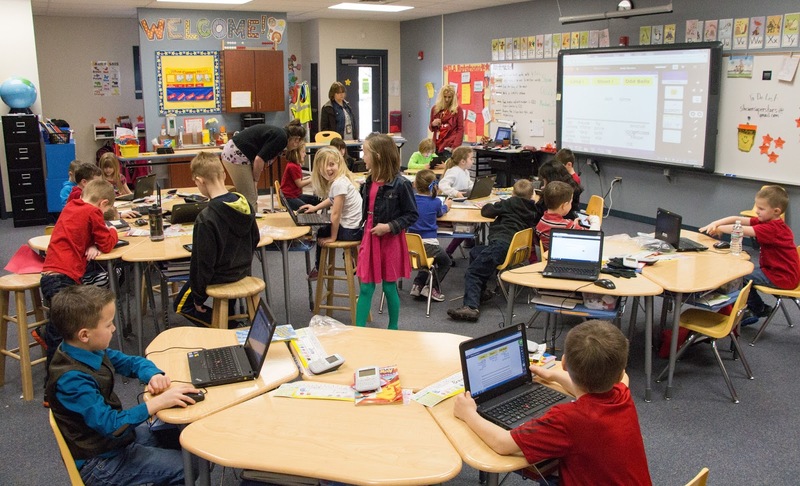 All technology in the classroom is not and does not have to be "high tech," but teachers who shun technology are doing their students a huge disservice. In fact, I'd go so far to say they are doing their students harm. Technology as an integral part of learning is not an option. When is Math More Than Math?